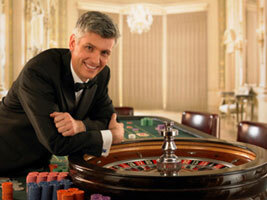 Roulette is one of the most popular casino games in both land based and online casinos. The game's rules are rather easy for one's learning and understanding. If you have no experience in playing Roulette our article will help you to familiarize yourself with all peculiarities of this game. The most popular and playable are American and European. The difference between these two games consists in the fact that American wheel has 36 numbered slots colored in black and red and two green zero slots: zero ("0") and double zero ("00") while its European counterpart has no double zero pocket. It creates considerable difference in house edges: American - 5.26%, European - 2.7%. So, playing at European Roulette wheel one has better casino betting odds. That is why it is rather difficult to find European Roulette wheel offered by land based casino. But there are a lot of online casinos that offer European Roulette for their players. Straight-up - it is a classic bet. The player is trying to predict the number on which the ball will lend. The payoff is 35:1, but the odds are the worst. Split 9 (or two number) - the player place the chip between two numbers. If one of these numbers hits, the payoff is 17:1. Street (there number or stream bet) - The same as is the previous one but with three numbers. The payoff is 11:1. Corner (or square) - the player bets on 4 numbers. The payoff - 8:1. Five-Number (for American roulette wheel) - the player bets that one of these numbers will win: 0, 00, 1, 2, or 3. Red or Black - the player is trying to predict which color the wheel will show. Even or Odd - the player places his/ her bets on even or odd numbers. Column Bets- the player place his/ her bet on 2 numbers of any of the vertical lines ( for example, 1-4-7-10). Do you read roulette guides? RouletteTrainerCasino.com © 2019. All Rights Reserved.